Pumps Market size will surpass USD 91 billion by 2025; according to a new research report by Global Market Insights, Inc. Global pumps market is mainly driven by increase in fixed investment in developed countries and rapid industrialization in developing countries in Asia Pacific, Latin America and parts of Eastern Europe. Spending in the fixed investment makes easy for the manufacturers to upgrade and expand their manufacturing facilities which involves the applications of pumps for several purpose. This trend of increasing fixed investment in developed countries is expected to continue and anticipated to boost the global pumps market size during the forecast period. Rapid industrialization in Asia Pacific has increased investment in water & wastewater treatment and several end-use industries such as mining, oil & gas, building & construction, pharmaceutical, chemical, food & beverages, agriculture, etc. in which pumps find their extensive applications in daily business operations. For instance, in 2014 the Asia Pacific construction industry is forecast to expand at over 5% CAGR over the forecast timeframe mainly due to strong government initiatives to enhance public infrastructure and escalating residential construction in countries such as India and Indonesia. High equipment, operational and maintenance cost is the key restraining factor for the global pumps market. Despite the high cost incurred by the manufacturing and maintenance of the pumps, indispensable use of pumps across industrial sector including oil & gas industry, building & construction, mining, agriculture, etc. will positively impact in growth dynamics of pumps market by 2025. Portable pumps are small in size and are generally used in emergency applications such as fire brigade and other industrial applications such as industrial dewatering. In 2018, portable pumps market valued over USD 13 billion and is expected to grow at a CAGR of 2.6% during 2019–2025. Depending on the pumps position, market is divided into, submersible pumps and non-submersible pumps. Non-submersible pumps cannot be immersed in water and are commonly used in the industrial sector. 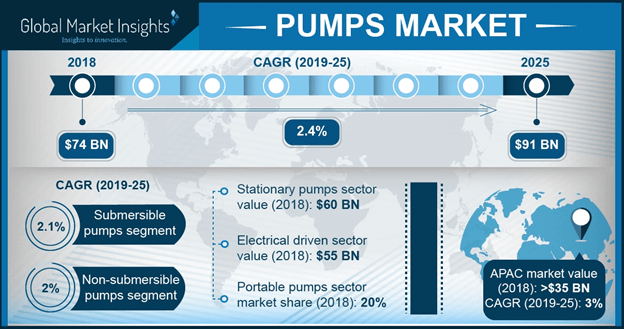 In 2018, pumps market was led by non-submersible pumps and was valued over USD 46 billion and will grow by over 2% CAGR during the forecast period owing to rapid industrialization in Asia Pacific. Depending on the technology involved in operation, pumps are classified as centrifugal pumps, diaphragm pumps and others. Centrifugal pumps are most commonly used pumps and has led the market in 2018, valued over USD 53 billion and will grow with a CAGR close to 2% over the forecast timeframe. Presently Asia Pacific is the leader in global market which is followed by Europe. Asia Pacific pumps market size was valued over USD 36 billion in 2018 which is expected to grow with highest CAGR close to 3% from 2019 to 2025. Global pumps market share is majorly accounted with several medium and large scale manufacturers in the market. Key players in the market include Kirloskar Brothers Ltd., Xylem Inc., Atlas Copco, MultiQuip, Gorman Rupp, Magnum, Wacker Neuson, Generac, Gardner Denver, Grundfos, Sulzer Ltd., Flowserve Corporation, Ebara Corporation, Shimadzu Corporation, Schlumberger, Baker Hughes etc. Prominent players in the market are focusing on increasing their product portfolio to attain competitive edge in the value chain. For instance, in October 2014, Baker Hughes launched a new product, ‘Centrilift FlexPumpER’, an extended-range pump, which expands the operating range of a single electrical submersible pumping (ESP) system.